Paco, a Mexican peasant, is nearly executed for rebelling against his wealthy boss. Meanwhile, Polish Mercenary Sergei Kowalski is hired to ensure that a small fortune in silver travels safely across the border. Curly (Jack Palance), learns of Sergei’s mission, and plans on intercepting the silver before it reaches its destination. However, things take an unexpected turn when Paco and Sergei cross paths. Sergei agrees to school the Bandito in the ways of the revolutionary, albeit for an exorbitant fee. This little arrangement soon proves far more expensive than Paco could have ever dreamed. The Mercenary is one of two spaghetti westerns directed by Sergio Corbucci and released in 1968, the other being The Great Silence. Though it isn’t listed prominently among Django Unchained’s many inspirations, it’s an obvious influence. Corbucci offers a somewhat lighter touch this time out, yet he becomes even bolder in other regards, namely the film’s political overtones. In Corbucci’s films, mood and tone are often dictated by setting. Django trudged through the mud, while The Great Silence braved The Great Blizzard of 1899. Both films boasted a rather oppressive atmosphere, as to better convey the underlying themes of their respective stories. By comparison, The Mercenary is relatively high-spirited. Characters and structures remain enshrouded in dusty desert winds. There’s an understated sense of freedom, even hope. Bearing those thoughts in mind, one wonders what she would think of the relationship between Sergei and Paco in The Mercenary. 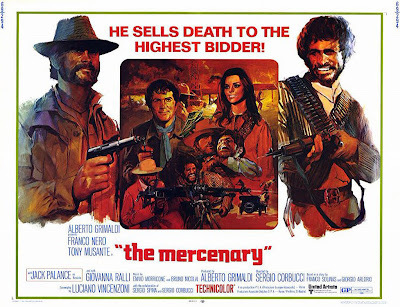 Due to its political subtext and leftists leanings, The Mercenary is a prime example of what is known as a Zapata western. Such films usually take place during the Mexican Revolution of 1913, and depict strife between the upper and lower classes. The film presents a cynical worldview in which the revolution cannot be televised, but is nevertheless for sale. Sergei is the consummate European capitalist. He pimps the situation for all it’s worth, and is always ready to move on when it’s no longer profitable for him. Initially, Paco has the values of both a peasant and a lowly bandito. His strong-headed better-half prods him towards a higher level of consciousness. The influence of The Mercenary on Tarantino is readily apparent. Dr. King Schultz dresses more than a bit like Sergei, though he is no way as suave or as outwardly arrogant. Spoiler Alert: Calvin Candie meets his demise in a manner similar to that of Curly, though under much different circumstances. Last but certainly not least, Quentin has always had an affinity for the musical scores of Ennio Morricone, which have always featured prominently in the films of both Sergio Corbucci and Sergio Leone. His piece “L'arena,” which serves as the theme music for The Mercenary, resurfaced 36 years later in Kill Bill Volume 2. Filmmaker Robert Rodriguez is also clearly an admirer, having recycled Sergei’s most enduring character tic for his breakthrough feature, El Mariachi. The Mercenary is lighter, more entertaining view of the American west as seen through the eyes of Italian filmmaker. The requisite grit and brutal honesty are still intact, but the message is delivered in a less confrontational manner. As a genre, Spaghetti westerns aren’t known for their versatility. Still, visionaries like Corbucci were inventive and brave enough to develop a number of variations. As cynical as it is, The Mercenary hints at the brighter tomorrow that hides just over the horizon.